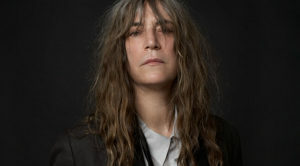 In 2015, 40 years after the release of her debut album, Horses, singer Patti Smith began to honor the album’s “longevity and lasting influence” with a series of special shows centered on the album. 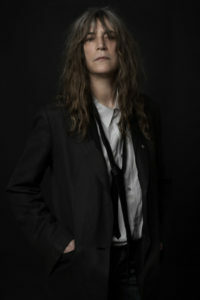 Smith and her band—Lenny Kaye and Jay Dee Daugherty along with bassist/keyboardist Tony Shanahan, who’s been part of her band for 20 years—will hit a few spots in the Midwest to continue the anniversary celebration. When we recently phoned Smith at New York office, she admitted it was a “quiet day.” She had woken up early to write for a few hours and then planned to read and take a walk. 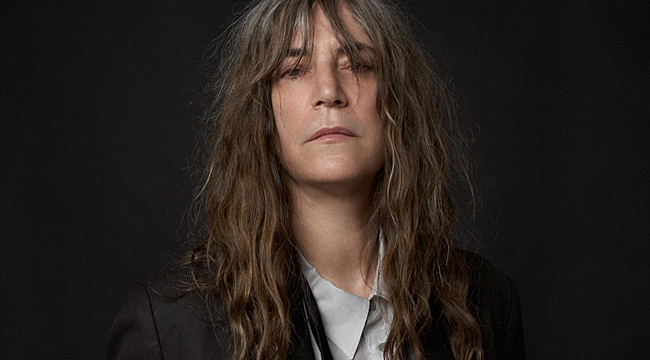 “Yesterday, I finished a deadline on a small book so I can relax a little today,” said the Rock & Roll Hall of Famer. You started performing Horses in its entirety in 2015. What was it like to go back to the album? We started at the end of 2015. The album’s fortieth anniversary was November 2015, and we performed it quite a bit and did the actual celebration in Electric Lady Studios where we recorded it. On the actual date, November 10, we did a live show there and a live album. It was really great. That was our kickoff. We toured a lot of Europe. We’re sort of a European band in that we seem to resonate there. We had to take a hiatus in 2016, which is why we’re finishing off in the Midwest so late, because my drummer had to undergo cancer treatments in 2016. We took time off. Now, he’s fine and we’re back on track. I wasn’t supposed to be touring right now but I decided to do five Midwestern dates. And what will be like in 2017 when it seems as if the world has seemed to undergone a huge political shift? It’s very emotional—performing. Our concerts always resonate some political concern whether it is Standing Rock or the election itself or our environment. Of course, it will resonate within it. We do the album intact exactly as it’s sequenced on the record but because of the way it was structured. There is room for improvisation in “Land” because it was improvised in the studio. I keep the structure but allow [the character] Johnny to explore what is happening in the present. Every night is different. It reflects the city we’re in, the current climate and the energy of the people. These are our first post-election Horses performances so I don’t know. I have done some performances since and things come into play, so we’ll have to see what happens. I’m looking forward to it. I chose five cities that had given us tremendous support in the past when the album first came out. Cleveland was one of our big cities. Our first single, “Gloria,” has a [cover of] “My Generation” live in Cleveland on the back of it. It was one of those unforgettable concerts. It was really raucous. That stayed in my memory. Each city has a special meaning because I have a specific memory of the city at that time. At the Cleveland show, John Cale was playing with us and it was really, really quite a raucous night. I think it’s the night where I said, “We created it; let’s take it over.” It became our mantra. It’s the idea that rock was created as a revolutionary expression. Looking back on it, what were the social and/or political forces that drove the songs on Horses? When we started working in the early ’70s, we didn’t want rock to be some business and some corporate thing devoid of revolution and political energy. I was born in 1946 and was privileged to watch rock ‘n’ roll completely evolve. When I was a little girl and heard Little Richard sing, it was exciting. It evolved more and more poetically and politically. In the late ’60s and early ’70s so many things happened. Jimi Hendrix died. Janis Joplin died. Brian Jones died. Bob Dylan had a motorcycle accident. The political landscape was changing. Yes, there were people speaking out like Neil Young, but we lost a lot of people like Jim Morrison. There was a shift in who our chief spokesperson were. It was a cultural vocabulary that was being built by these people and then many of them died. Stadium rock and disco and various things—and I’m not putting those things down—were happening. My people were trying to forge a new bridge between the people we had lost and learned from and the future. There was a definite shift. Things got more glamorous, and people were making more money. We wanted to pull back and remember where we came from but also do something new in a grassroots way. Groups like Television and the Ramones and all the groups that came out of CBGSs. But bands came from all over. You had the Clash. We were traveling all over Europe and there were exciting alternative things happening in the ‘70s with acts who became big in another way. None of us had money and not many of us were exceptional. We weren’t exceptional musicians. We weren’t Jimmy Page. But we had something to say and we had energy and a lot of desire to do something new. None of this began with expectations of becoming rich and famous. We just wanted to do our thing. We wanted freedom, and we wanted to be heard. At the time we were doing these things. We weren’t thinking of career-based concern. You didn’t have videos and a publicist. No one had cameras and no one had cell phones; it was a whole different climate we were creating in. Talk about your approach to writing lyrics. What inspired you to write with such a poetic sensibility? I was never a musician. I came to New York City to study art and write poetry. When I started performing poetry, I found it sort of static. I was a child of rock ‘n’ roll. I added musicians starting with Lenny Kaye and then Richard Sohl to make it more exciting to deliver poetry. I originally didn’t sing that much. I broke into poems. I rapped poetry. I started in 1971, really just as a poet who was trying to do something a little new in terms of performing poetry. I had all of these mentors like Jim Morrison and Bob Dylan and Jimi Hendrix. They had a certain amount of poetry infused in their lyrics. I wasn’t a musician but I had a strong relationship to music. Truthfully, I’m a natural performer. It comes naturally to me. I don’t know why. It’s just something I know how to do. I evolved quickly in a couple of years from simply reading to singing a cappella song and improvising poetry with a little music behind me and then singing more. When we recorded horses, I didn’t consider myself a singer. I sang but it was all intuition. I didn’t have any training or background that would have implied that I’d wind up singing but I did. Your performances have such a visceral quality. One of my big influences was Johnny Winter. I knew him and met him in 1970 or 1971 at the Chelsea Hotel. I often went to his concerts. I was working at a bookstore. I would watch him in the wings. I knew him really well. I had never seen such a visceral performer. He was half blind but he would leap into the audience and never miss a beat. He was an unbelievable guitar player. He had so much energy and charisma. He was an in-your-face performer as well as being really gifted. I sat on the stage watching Janis sing. I saw other performers and what I liked and didn’t like. My models were truthfully male. I liked women singers but as a performer, I wanted to perform like Jimi Hendrix and I didn’t want to perform like Connie Francis. I loved Grace Slick who had an unbelievable voice, but I wanted to be like Jimi Hendrix. Even if that seems really presumptuous, that’s what I wanted. I was looking to that to have a physical relationship to what I was doing. Being a great singer is its own merit. That’s not my number one ability. When people ask me if I’m a musician, I tell them to just call me a performer. I know I’m a performer. The album made a remarkable impact. Talk about the role that the cover art played in that respect. You know, when you first begin, everything, at least for us, was very innocent. I recorded Horses for I thought a very marginalized group of people because of their gender or sexual identity or politics. I was hoping it would communicate to a certain number of people. I felt like they didn’t have a whole lot of people speaking to them. That was my goal. In terms of the cover, Robert [Mapplethorpe] was the artist of my life. I wanted him to shoot it. He had his aesthetic and I left it up to him. In terms of how I was dressed, that’s how I dressed. I wasn’t in costume. That’s what I wore on the street and on the stage. I wanted in terms of how I presented myself, a mixture of the writer and poet–Baudelaire would wear black ribbons and white shirts. I was trying to encompass rock ‘n’ roll and also poetry. Robert took the picture, and he felt it had magic and we were happy, but I didn’t have any expectations about the photograph. I didn’t know how it would either appeal or not appeal. In fact, the record company hated the picture. They hated that my hair was messy and that my shirt was ripped, but I had creative control over what I did. They let me have the picture, but it wasn’t well received. It wasn’t a calculated gesture. It was just what I looked like. Robert took it beautifully. It drew a lot of people to that album. Michael Stipe saw the record and was drawn to the record and he bought it. He was a teenager. He listened to it over and over and he said it moved him to want to have a band. The picture taken as an artistic expression between Robert and I resonated with people and drew people to the album. I still dress the same way. My daughter looks at pictures of me and says, “Mommy, you’re the same person. “ I’m gray. But I know who she is. I can look at that picture and, yes, I’m 70 years old and it was 40 years ago but I still understand who she is. The nice thing about doing this tour is that my son Jackson, who’s really a gifted guitar player, is playing with us too. He lives in Michigan in the Detroit area, and I wanted him to play on this particular tour.